They can only be used for a few months as baby outgrows one easily approx 4 months old. 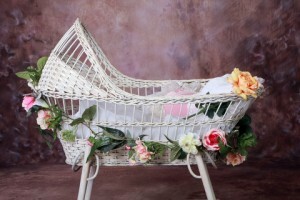 wicker ones can have sharp edges that need repairing if handed down for other babies to use.If using a 2nd hand one it should have a new Moses basket mattress for the health, safety and well being of your baby. the hassle of taking it up and down stairs daily if baby has not upstairs sleeping arrangements as well. Keep cats away from baby they love to sleep in a crib as they are cosy and confined and are a danger to a baby when sleeping. cheaper than a crib or rocking cradle. Some come complete with bedding saving costs. Can be used on the floor or with a stand. Do some moses baskets com,e without fancy bedding? Yes .Thick quilts can look appealing and cute but remember to cover your baby with thin sheets and blankets rather than an extra thick quilt use the no higher than baby’s shoulder rule for applying too many layers and tog levels in cots cribs and moses baskets.